Where are Texwrap machines manufactured? All Texwrap machines are built in our centrally located facility in Washington, Missouri, an hour southwest of St. Louis. Our 75,000 square foot building houses the latest CNC manufacturing capabilities. In addition to being a US manufacturer, Texwrap is dedicated to using US manufactured components in its equipment. I have a unique application. Can Texwrap help me? Texwrap specializes in creative solutions to unique problems. Where many manufacturers offer only stock solutions, Texwrap has the willingness, the experience and the design staff to take on the toughest challenges. Each application is reviewed by Texwrap’s engineering staff to first qualify and then offer the best engineered solution for each customer’s needs. Can I purchase a machine directly from Texwrap? Texwrap sells through a network of highly-qualified distributors throughout North America. These distributors are factory trained at Texwrap to provide field support for your equipment. Having a local distributor helps reduce downtime by providing immediate technical support and parts. Is there an advantage to Texwrap's relationship with Stork Fabricators? The unique relationship Texwrap Packaging Systems has as part of Stork Fabricators offers our customers several advantages. First of all, since we are part of the same company and located in the same facility, we have complete control of both the quality and the schedule of our components. Stork Fabricators is one of the highest tech metal fabricating shops in the country. They employ laser, plasma and waterjet cutters, CNC machining and bending equipment which means that Texwrap fabricated parts are consistently produced to the highest standards. Secondly, if a Texwrap customer needs a non-stock part in an emergency, we aren’t at the mercy of an outside machine shop to produce the part quickly and accurately. This means better response to our customers and less downtime for them. What is the Texwrap Versa Seal side seal? The exclusive Texwrap Versa Seal side seal insures consistent, high quality seals across a wide range of film types and gauges. The TVS is a very simple device yet offers outstanding control of the three elements necessary for a good seal- time, temperature and pressure. This control starts by tightly clamping the film between parallel belts while a special heating element seals and separates the film between them. Because the element seals with radiant heat, it avoids wear, film buildup, and the need for adjustment or repositioning to maintain a good seal. With a Versa Seal, there is also no need to make temperature adjustments as wrapper speed changes. As speed increases, the film simply stays in contact with the element longer. The slightly diverging belts continue to hold the film securely over a longer distance allowing the seal to thoroughly cure and the trim to be easily separated. Usually the fix for too much film tension at the seal is a larger bag but, because the belts on the TVS allow the tension on the film to be isolated from the package, you get consistent seals while using the absolute minimum film width saving money on every package. The TVS requires no air and has very few moving parts for ease of operation and minimal maintenance. Why does Texwrap use side seal wrappers for bakery systems instead of lap sealers? 1. A consistently positive, secure lap seal is much harder to make than a positive side seal. 2. Lap seals are prone to open seals due to crumbs and other debris inherent in the bakery environment. Since side sealers do not seal on the bottom of the package, they are impervious to seal contamination from debris. 4. Side seal wrappers potentially use less film. On bakery applications, lap seal plows frequently have to be oversized to account for variations in product size or shape thus using more film. 5. Precise film sizing is critical on a lap sealer which means more film sizes in inventory. Side sealers are much more flexible in accommodating different size or shape packages. 6. Changeover between products takes longer on a lap sealer. Side sealers do not require parts for package size changes. 7. On a lap sealer, each SKU requires the investment in a plow. When size or shape varies, a simple adjustment is all that is necessary on a side sealer. What is the difference between single wound (flat) and center folded (folded) film? Center folded film is folded in half before it is wound on the roll, flat film is not. Most machines such as L-bar sealers and side seal machines can use either form but a center folder device is needed to fold flat film before it goes into the wrapper. Lap seal wrappers use only flat film which is wrapped around the former or plow to form the wrapping tube. The advantage of using flat film on any wrapper style is that the roll length is double that of folded film which reduces the number of times production has to be stopped to load a new roll of film. Which types of film run on Texwrap equipment? Texwrap wrappers can run a wide range of polyolefin, polyethylene, PVC and some polypropylene based films from the new 30-40 gauge films up to a full 3 mil. Texwrap offers many different seal systems and testing allows us to select the best one for your application and chosen film. All films should be tested to assure machinability and seal quality. Texwrap's film sizing formulas often seem to recommend wider films than absolutely necessary. Why take this approach? We understand that our film formulas are conservative (they do include scrap). The reason we estimate film width on the high side is that our years of experience tell us that doing a minimalist estimation based on ideal product dimensions from a chart are not real world and, while it gives a prospective customer a theoretical lower film usage projection, those results are often not achievable in actual production. Customers' products are often not perfectly square as they bulge slightly and vary in size slightly due to small inconsistencies or variations in the forming/packing equipment. Other real world issues can include the need to make the film bags larger than the theoretical smallest size in order to give different films the time and space to shrink completely to eliminate wrinkles or dog ears. Rarely is it the case where a smaller bag results in a more acceptable package appearance. Slightly wider film size also allows the user to eliminate sealing issues in real production, at real production rates, by increasing the bag size slightly to eliminate film tension at the points where the seals are made which is the cause of most poor or weak seals. Very frequently new users find that , as their operators become more familiar with the equipment, they find small ways over time to hone the film usage and run with narrower widths. For all of the above reasons, we find that our customers are happier and have smoother startups if they approach their film selection in this way. What makes Texwrap's user interface so easy to use? Texwrap leads the industry in easy-to-use intuitive machine interfaces. The touch-screen is the communicator between operator and machine, therefore it must be designed and organized similar to the way an operator thinks. Texwrap’s machine interface transforms complicated machine settings into an easy, intuitive, self-teaching interface that speaks in layman’s terms. Anyone who can operate an ATM machine can setup and operate a Texwrap machine. What is a product library? Product libraries are used to record individual product setups and recall them for later use. After an operator finds the perfect settings for a particular product, he/she simply saves the settings with the push of a button and entry of an alpha-numeric title. Once saved, the product can be recalled by name at a later time and sent to the controller to perfectly repeat the original setup. A virtually limitless number of different program files can be stored. How important is shrink tunnel performance in final package quality? Often overlooked, the design of a shrink tunnel often plays as large a role as the wrapper itself in the quality and appearance of the final package. If the tunnel can't impart sufficient energy into the film early enough to create the maximum ballooning effect and allow the bubble to collapse at just the right rate, the film won’t shrink to its maximum extent, imperfections won’t be cleaned up and end result will be less than desirable. The heater size, fan velocity, volume of air, ability to precisely control the volume and direction of the air, belt type, and tunnel length are all critical factors in the choice of a tunnel. Heat and volume of air without the ability to control the direction or, control of the direction without sufficient volume, will produce less than satisfactory results. Texwrap’s standard line of forced air tunnels have proven over years of use to be capable of producing excellent results with most packages. Digital temperature controls, high velocity fans, individual top and bottom controls for air direction, and variable speed conveyors all contribute to the precise control of the process to put the right amount of heat of the right places over the correct amount of time to produce outstanding shrink results. What is the difference between forced air and radiant heat tunnels? What is a "convection" tunnel? Since "convection" simply refers to the transfer of heat from a source to another object through a medium (air), both forced air and radiant types of tunnels are actually convection tunnels. Forced air tunnels depend on imparting sufficient shrink energy to the film by means of large volumes of high velocity air. For most products, this type of tunnel does an excellent job. Radiant convection tunnels use larger, slower rotating fans to move air within the chamber at very low velocities. Often misnamed simply “convection” tunnels, Texwrap prefers to call this type of tunnel “radiant” convection. These tunnels produce a more “gentle” shrink which may result in superior package appearance for some products, especially very thin or lightweight items. How does Texwrap determine right and left hand machine flow direction? For all Texwrap wrappers, the flow direction (right-hand or left-hand) is determined from the perspective of the product flow relative to the normal operator’s position.When the operator is standing facing the wrapper and the product enters the wrapper from the right, it’s a right-handed machine and vice-versa for left handed. What is a centerline wrapper? With a center-line wrapper, as the name implies, the product stream always flows down the centerline of the wrapper and the side seal unit is adjusted in and out according to the product size. In side-registered wrappers, the side seal unit does not move and, as the width of the incoming product varies, the wrapper and the infeed conveyor must be adjusted to register the product to the side seal unit. What are AC inverter duty motors and what's special about the way Texwrap uses them? AC inverter duty motors are unequaled in reliability and trouble-free operation. Only the best AC inverter duty motors are used on Texwrap equipment. These motors are rated for full load amps at 15 hertz. Texwrap has taken this technology one step further and controls these motors with sensor-less vector AC inverters. They monitor motor speed and adjust torque as needed to hold commanded speed. This means that conveyor speeds are accurate regardless of product weight or wrapper speed. In the event of replacement, every AC inverter used has a removable eeprom which means there is no tuning of drive parameters and no setup for the maintenance department. Simply install the new drive; swap the eeprom from the old drive to the new drive, and the drive is ready for operation. What are the advantages of a servo machine? Contrary to what most people believe, the number one reason is reduced maintenance, not speed. A secondary reason is increased speed. Are all servo wrappers the same? What is "Gen 3"? No. Many manufacturers have simply replaced pneumatic controls with servos. Texwrap servo wrappers were developed from the ground up to withstand the high torque loads generated by the servo motors. Texwrap is the only North American shrink equipment manufacturer using true "Generation 3" technology to integrate the servos, the PLC and the mechanical elements of the machine to fully utilize all the benefits of servo technology. Texwrap uses true "Gen 3" controls on its servo wrappers. They use “multitasking” to compute many tasks at the same time. The servo motors and servo drives are updated every millisecond. This means important information from the motor or drive can be read in real time with no communication lag. It also means that just one ladder logic program controls the entire machine. Non-"GEN 3" machinery has a PLC to handle I/O, and servo drives with separate programs to handle motion control. This can result in program synchronization issues, causing cross seal registration errors. The controllers used in Texwrap servo wrappers have none of these limitations resulting in very precise, smooth, motion coupled with integrated I/O control in a very efficient package. Simply installing the eeprom in the controller automatically configures the servo drives and motors. Why does Texwrap use servo motors instead of pneumatics on high speed continuous-motion wrappers? 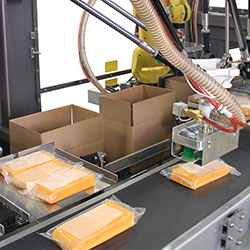 Texwrap continuous-motion servo wrappers utilize a servo motor for the closing and opening of the cross seal. Electronic servo camming allows for extremely fast motion while also gently ramping into both the closed and open position at the last moment. This eliminates any “bounce” during the sealing process resulting in a very strong seal with seal times 1/3 that of pneumatic equipment. Seal pressure is also controlled via touch-screen setting to accommodate different film thicknesses & types. A second servo motor powers the cross seal forward with the product during sealing using a “following” motion and then back to the home position using electronic camming. The servo motors smoothly control the position and motion of the cross seal components resulting in very fast cycle times and maximum production rates. They also completely eliminate the impact loading, fatigue and mechanical wear-and-tear of clutches, brakes, and cushions common in pneumatic systems. The result is years of trouble-free 24/7 operation. What makes Texwrap's vertical orbital systems unique? Vertical orbital machines allow the upright or vertical wrapping of products such as bottles, cans, and jars directly from a filler. Before now, the products had to be laid on their sides prior to wrapping on a conventional wrapper. Wrapping vertically simplifies product handling and enhances the ability to maintain label orientation. 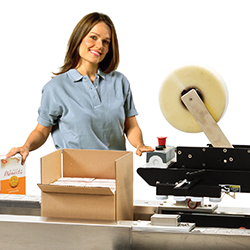 Texwrap also offers an optional servo label orientation system which detects product position and then spins the packages to precisely align the labels producing a very attractive multipack. They are the fastest on the market, make better packages using less film, and are more reliable. Patented by Texwrap, orbital head wrappers combine very fast, precise servo controls along with an elliptical motion of the sealing head. This allows extremely fast speeds to be reached by reducing the need for the head to move with the product in order to make the seal. Texwrap's vertical wrappers also use a full bottom TGM trim seal to securely enclose the product as opposed to a traditional static or thermal overlap seal. In addition to providing an outstanding seal, this system eliminates the unsightly side seal across the side panel of packages common in other machines. 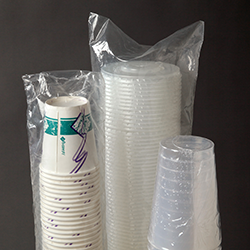 Texwrap's vertical wrappers also use less film on every package. Because we have very precise control of the conveyor speeds, we can momentarily slow the exit conveyor as the seal is being made which means that every bag is shorter resulting in significant film savings. Often used to wrap multipacks for retail sale, the precise product and film control of the 914 allows high speed operation with precise print registration. Why is Texwrap’s warranty longer than any other in the industry? Our equipment is simply built better. In engineering, long before the assembly process starts, the software we use allows our designers to stress-test critical components and assemblies in the computer to predict where failures might happen and eliminate them before the first part is ever produced. Secondly, because Texwrap is part of Stork Fabricators, every fabricated part is produced on some of the most accurate and high-tech metal cutting, forming, and machining equipment available. In final assembly, every machine is built according to a step-by-step instruction manual that accompanies every unit through production. And finally, every Texwrap wrapper is thoroughly run after final assembly to insure that it meets our exacting standards and to insure that the customer will get years of outstanding service from their Texwrap product. Even Texwrap’s purchased parts warranty is longer than most. This is possible because our long-term suppliers have a history with us and a level of confidence in our designs that allows them to extend warranties to us beyond what they normally offer. What is the advantage of Texwrap's "Solid Works" design software? All new Texwrap designs are created in "Solid Works" design software. This program allows us to design, simulate & analyze each system before manufacturing. A series of design constraints are analyzed including stress, strain, fatigue, and much more, insuring long term machine reliability and function. Does Texwrap do all of its own programming? Texwrap does 100% of the programming for all of the systems it manufactures. Some manufacturers outsource programming. In-house programming means that our technicians and engineers can provide quick answers for problems that may come up in the field or when production demands change resulting in the need for program modifications. Why buy Texwrap conveyors rather than third party? Texwrap conveyors are designed for years of trouble-free use and are ruggedly built to handle the same 24/7 duty cycle as our wrappers and carry the same Built Better/Backed Better 3 year warranty. What are the differences among the various Texwrap flighted conveyor styles? The standard flighted FC conveyor is a single chain design. Because of this, at the end of the conveyor, the flights or lugs are able to pitch slightly forward as they lower. For this reason, this conveyor is not recommended for lightweight or slippery stacked product as the lug movement can actually cause the product to slide or shingle. This type of conveyor would be ideally suited to products such as boxed or trayed products, single piece items, or other products where shingling is not a concern. The HFC conveyor is a dual chain design which allows complete control of the motion of the lugs. In this design, the lugs or pins push the product to the end and then drop cleanly away with no forward or backward movement to affect the product. This conveyor is limited to a lug height of 3 inches or less. The HFCB flighted conveyor is a true “box-motion” design. This allows for taller lugs which push all the way to the end and then drop straight vertically with no forward or backward tilt. The multipacking conveyor MPFC uses horizontal bars connected to chains on either side of the conveyor in place of vertical lugs to move groups of product such as boxes, bottles or jars to the wrapper infeed to be combined as a single pack. Does Texwrap offer film splicing options to help reduce roll changeover time? Texwrap offers both manual and fully automatic film splicing systems. The automatic film splicing system is designed for use with high speed wrappers where the customer desires to eliminate the downtime associated with film roll changes. While one roll of film is being used, the operator loads a second full roll and prepares the splice by applying double-faced tape to its leading edge which is held in place on a vacuum plate. When the unit senses the end of the supply roll, it slows the machine down long enough for the tail of the spent roll and leading edge of the new roll to be automatically pressed together. Once the splice has been completed, the wrapper automatically returns to full speed. When would the automatic film splicing option make sense? In situations where any amount of downtime even the 3-5 minutes required for a film change is an unacceptable loss of productivity, the splicing option makes sense. The cost can be justified easily through the elimination of lost production. The other situation where the film splicing option makes sense is where there is little room for product accumulation between the production equipment and the wrapper. If production cannot be stopped for film changes without manually having to pull product off line for that period of time and then reinserting it later to be wrapped, the splicing option can be easily justified. Available on either side seal or lap seal units, intermittent-motion units encapsulate the product in a continuous tube of film and then seal and cut them apart downstream. With an intermittent-motion sealer, the end seal carriage remains stationary and does not move with the product. This necessitates having to stop the product stream momentarily as each seal is made which limits the speed of the wrapper. In this type of sealer, the incoming stream of products does not stop while the end seal is being made increasing the throughput speed. 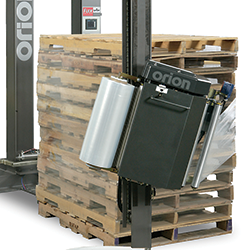 Continuous motion wrappers are available in both box-motion and orbital styles. Available on side-seal or lap-seal machines, the end seal carriage on this style of continuous-motion unit moves with the product making the seal so that the product stream never stops. During the time required to make the seal, the jaws close and the carriage moves forward with the package at the same speed. As the seal is completed, the seal jaws open and the carriage quickly returns to engage the next package. Box-motion refers to this rectangular-shaped path of the sealing head. The maximum throughput speeds of box-motion wrappers are physically limited at some point by the requirement for the sealing carriage to rapidly move back and forth with each package. Orbital head machines do not have this same limitation and therefore can run at higher speeds. This is the ultimate in speed available in continuous-motion sealers. Patented by Texwrap, orbital head wrappers combine very fast, precise servo controls along with an elliptical motion of the sealing head. This motion allows extremely fast speeds to be reached by eliminating the need for the head to move with the product in order to make the seal. Motion Trim is Texwrap's exclusive technology for increasing throughput speeds by manipulating a number of machine functions through one control to shorten the time needed to make a package. On sealers without Motion Trim, the sealing cycle can best be described as a rectangle or "box" where the seal head opens vertically to its maximum height (one end of the box), the product travels horizontally past the seal (the top and bottom of the box) and then the seal head closes vertically to complete the fourth side. If the product to be wrapped is not tall and doesn’t require the head to fully open each time in order for the product to pass, then that time is wasted. By entering a setting into Motion Trim that corresponds to the height of the product to be wrapped, the corners of this imaginary box and the motion necessary to complete it can be significantly clipped off or "trimmed" saving cycle time and dramatically increasing machine throughput. Speed modulation is a three-photo-eye system that monitors upstream product accumulation and toggles between user defined speeds to keep the wrapper running most efficiently in sync with upstream production. When product runs out and none of the eyes are blocked, the wrapper will automatically stop and wait. When product accumulation blocks two of the eyes, the machine will run in the slower of the two speeds in order to match production. If all three eyes are blocked, the wrapper will run at its highest speed until the third eye is again unblocked. Autospacing is a technique used to separate randomly-spaced incoming products for wrapping. Used on medium speed three belt wrappers, a photoeye is mounted above the infeed conveyor which detects the front and rear edges of the incoming products and spaces them an exact distance apart for wrapping. Choke-spacing is a product feeding method commonly used by Texwrap in medium speed, continuous motion applications. Product is accumulated, usually on a slip torque conveyor, to provide the system with a ready supply of product. This accumulation is monitored to control wrapper speed. A grip belt is then choke fed from the accumulation. This allows the servo to make controlled moves to place the product with uniform spacing on the wrapper infeed. Overspeed refers to the technique of feeding a lug conveyor where the product is introduced into the space between the lugs by means of another conveyor running at a speed faster than that of the lug conveyor. This produces space behind the package which allows the lug to gradually catch up with the product avoiding any sudden jarring ensuring the products are not damaged and are precisely spaced for the wrapper.